What Are the Different Types of Turntable Mixers? Turntable mixers are commonly used by disc jockeys. Turntable mixers are electronic devices that combine audio signals from multiple sources for control through a single deck. These decks typically contain multiple channels, each equipped with controls such as knobs or sliders, in order to permit nuanced effects over the entire sound mix. Components commonly occupy entertainment venues, with multiple sound inputs such as microphones or musical instruments. These devices are also popular with disc jockeys (DJs); as such, they often feature cross-faders to permit an even fade between audio sources. Mixers typically differ in the number of channels they offer and the audio customization capabilities of each channel, as well as the number of inputs and outputs. Usually, mixers link components such as speakers, amplifiers, turntables, and compact disc (CD) players. Some offer users the bare essentials, while others provide many more technical features. Audio controls typically consist of equalization (EQ), left and right balance, gain, and meters. Choices typically range from very simple low-budget units to those providing two, three, or more channels for mixing of separate inputs. They can be categorized in terms of the technical requirements and skill levels of the sound engineer or disc jockey. 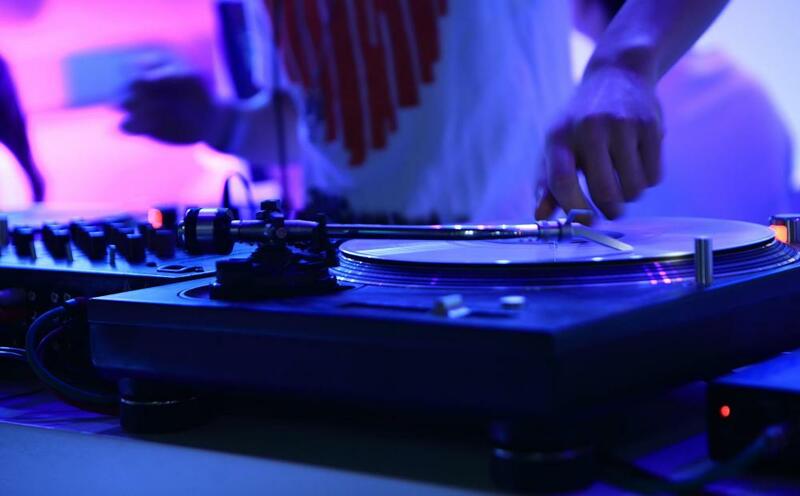 For turntable mixers used in live performance, the quality of a cross-fader is a primary concern. Budget mixers sport fewer inputs and are most suitable in casual applications, such as mixing sound for parties. Systems are sometimes noisy, particularly when linked with powerful sound equipment. Two-channel mixers have double inputs, with separate gain and EQ controls for each channel. Units may provide for cueing between channels and allow an extra input for a microphone. These turntable mixers essentially permit the smooth transitions between channels typical of continuous music or dance venues. At a more advanced level, three-channel mixers provide an extra dedicated channel for a microphone or instrument input. This grade of equipment is often better suited to handle the rigorous conditions of a public venue. Units may have kill switches that permit the operator to drop out low, mid, or high frequencies to desirable effect. These mixers may also be linked through accessory effects components to produce creative sounds. More professional four-channel turntable mixers might permit double microphone inputs, which might be useful for an addition of a vocal artist or instrument such as drums. This type of equipment might enhance its channels with numerous sound controls. Operators can better monitor peaks and fades, and output signals to multiple destinations such as headphones or monitors. Some performance equipment features special capabilities like beat counters, samplers, and automatic fades and starts. The quality of audio will depend upon the capacity of the equipment and any deterioration of audio signal due to its internal electronic design. Quality of case construction affects resistance to the vibrations that have negative effects on sound quality. Professional turntable mixers may offer additional features such as automatic pitch tuning, which can align music even after pitch has been altered by tempo or beat changes. Units differ in the components they might use to carry out their digital signal processing (DSP), as well as their capacities for introducing effects. How Do I Become a Mobile Disc Jockey? What Is a Frequency Mixer? How Do I Choose the Best DJ Headphones? How Do I Choose the Best Headphone Mixer? What Is a Dual Turntable? What Are the Different Types of Digital Mixers? How Do I Choose the Best Channel Mixer?